In a saucepan, warm oil over moderate heat. Add onion, garlic, and sweet potatoes; saute 5 minutes. Stir in broth, bay leaf, basil, thyme, and paprika. Salt and pepper to taste. Bring to a boil, and then reduce heat to medium low. Cover. Simmer until vegetables are tender but not mushy, about 15 minutes. 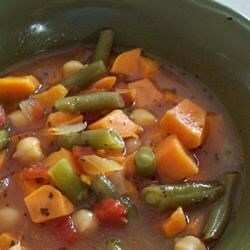 Stir in tomato, green beans, and chickpeas. Simmer uncovered until tender, about 10 minutes more. Serve hot.